The theater will open in a former Tom Thumb space at Skillman and Abrams. The theater will take over an old Tom Thumb space at Skillman and Abrams, in a pocket of northeast Dallas that might as well be Lake Highlands. The Advocate broke the news Monday, with the Dallas Morning News following suit the next day. And now, official word and renderings from the chain gradually putting a combination movie theater-restaurant-bar in every corner of North Texas: an Alamo Drafthouse is coming to East Dallas in spring 2017. The theater will take over an old Tom Thumb space at Skillman and Abrams, in a pocket of northeast Dallas that might as well be Lake Highlands. Top Golf is right down the street. It will be the third Alamo Drafthouse to open in North Texas. The first is in Richardson, and an outpost in the Cedars opened earlier this year. A fourth is set to open next summer as part of the Irving Music Factory development in Las Colinas. The Lake Highlands edition will have “7 to 9 screens” and 875 seats, each one a “luxury recliner with a footrest,” per a press release. Several theaters will be outfitted with 35 mm projectors for repertory screenings. A spinoff of the Vetted Well, the bar and restaurant with the rooftop patios at the Cedars location, will be included in the space. Alamo Drafthouse also plans to spur renovations to the shopping center at Skillman and Abrams. Anyone who has visited the Richardson theater since its opening in 2013 can attest that an Alamo Drafthouse seems to kickstart neighboring development. Several new restaurants have opened in that shopping center at Belt Line and Central Expressway, and a Half Price Books, formerly two exits north off of Campbell Road, moved in next door. As Alamo DFW CEO Bill DiGaetano said earlier this year, a lack of parking kept the chain from taking over and renovating the Lakewood Theatre, its first target in the area. But East Dallas fans of strictly enforced no-cellphone policies, themed repertory screenings, and dine-while-you-watch theaters now have a nearby option. Dallas – July 19, 2016—Alamo Drafthouse Cinema DFW announced today that Lake Highlands will be the location for the next Alamo Drafthouse in North Texas. Alamo Drafthouse Cinema will open at the northeast corner of Skillman Street and Abrams Road across the street from Top Golf in the old Tom Thumb space. The theater will open spring 2017. “It is no secret that Alamo has been interested in this part of Dallas for quite sometime. We couldn’t be happier about the location and the fact that we get to help take an old shopping center and turn it into a brand new entertainment destination for the residents. Dallas’ Economic Development Office as well as Council Members Mark Clayton, Jennifer Gates, and Adam McGough have been very supportive. We cannot wait to open Alamo in Lake Highlands and have a hand in this center’s top to bottom renovation.” said Bill DiGaetano, chief operations officer and owner, Alamo Drafthouse Cinema DFW. Alamo Drafthouse Lake Highlands will be a state of the art location featuring 7 to 9 screens and 875 theater seats. Each of the auditoriums will be equipped with the latest in 4K digital projection as well as excellent screen size to room ratio and 7.1 Dolby Surround Sound. Select auditoriums will also feature 35mm projectors so fans can experience classic and repertory content as they were meant to be seen. In addition to the superior AV equipment, the layout of each theater will eliminate the traditional front row, ensuring every seat in the house allows for a great viewing experience especially since every seat in the building will be a luxury recliner with footrest. 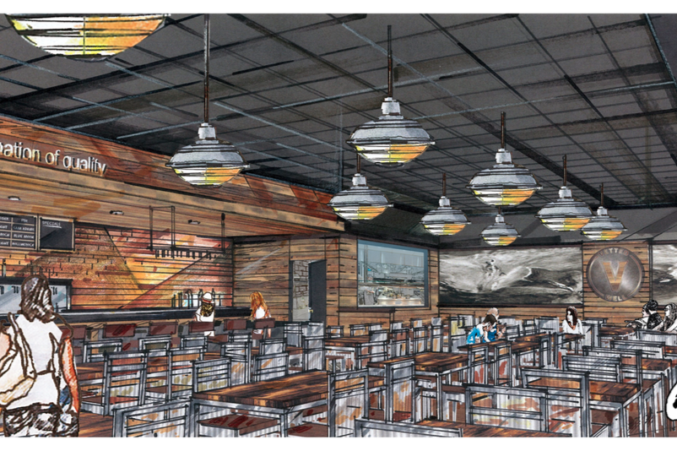 In addition to in-theater dining, Alamo Lake Highlands will feature a 175-seat Vetted Well restaurant and bar offering an extensive menu of draft and bottled beers, wine, cocktails and freshly made food. 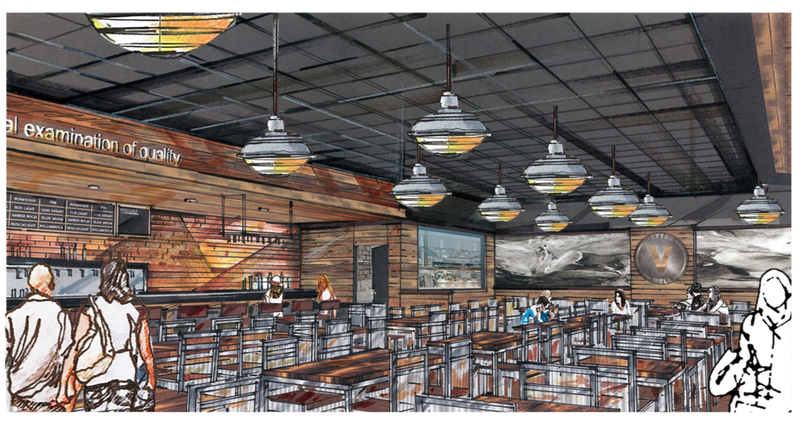 The restaurant will also feature a large all-season patio connected to the restaurant with overhead garage doors. Vetted Well will offer patrons an inviting place to socialize whether they are waiting for a movie or simply coming to sample the scratch-made food, cocktails and craft beer. Pending City approval the center will receive a top to bottom “face lift.” The renovation will take place concurrently with Alamo’s construction. “Retail Plazas Inc. (RPI) is pleased to announce that we have signed a long-term anchor lease with Alamo Drafthouse for the majority of the former Tom Thumb space in our Skillman/Abrams Shopping Center. RPI acquired the shopping center in early February of this year. RPI owns and operates well over 2-million square feet of shopping center space in the DFW Metroplex and specializes in revitalizing broken and/or underutilized properties; thereby enhancing their value. We are delighted with the speed with which we were able to lease the anchor space at Skillman/Abrams and the incredible amount of tenant interest in our redevelopment of the shopping center. I think the community will be better served with the extensive redevelopment and tenant mix at Skillman/Abrams; it will become the entertainment center of Lake Highlands. We look forward to working with Bill DiGaetano’s Alamo Drafthouse Group on this project,” said Jeffrey L. Olyan, president of Retail Plazas Inc.
Tyler Isbell of SRS Real Estate Partners brokered the deal on behalf of Alamo Drafthouse Cinema DFW. Mark Haijdu with Triumph Commercial Real Estate represented Retail Plazas Inc.